You know why I never bother with those Skytrax ratings? Well that is because some of them can just be a bunch of BS! There really isn’t much consistency amongst airlines these days, and for those that are truly good, you can really count them with one hand. Singapore Airlines and Cathay Pacific comes into my mind when you want to associate the words comfortable and flying together. When it comes to Indonesia, Garuda Indonesia is perhaps the best of the bunch, and I have even started to fly them internationally to Singapore for a start. The initial impression on my flights were good. There was new planes, and even nice hot food served between my flights from Jakarta to Denpasar, and tasty chocolates and nuts on the snack boxes served on shorter domestic routes. All that came to an end sadly after the airline won the ‘Most Improved Airline’ award in 2010. Thus even though they won the ‘World’s Best Economy Class’ by Skytrax recently, I wonder how Skytrax even ranks this airline. Cathay Pacific and Singapore Airlines both have stellar Economy Class that could put Garuda’s into shame. In the past few months, the airline have cut back on catering for domestic routes and instead of packaged tea, it is just a small container of water in the snack boxes. Gone are the chocolates or nuts, instead it is just one taste-less bun. This goes the same for the Jakarta-Surabaya route which is probably the single busiest route for Garuda Indonesia. The last straw came when they have the cheek to serve me a chicken dish with black corn. Just looking at it makes for an unappetizing meal. To make matters worse, the airline ran out of alternative choices even when we were seated in row 11 which was just a few rows down from the front of the economy class cabin. Thus my other travelling companions had to pick the dish with the black corns. 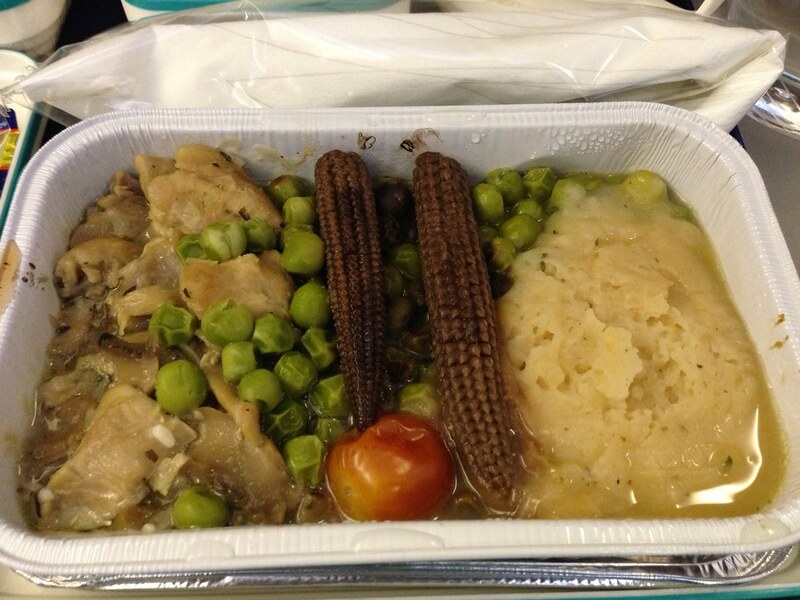 So it wasn’t just the case of one spoilt dish but a whole set of catering fail by supposedly an airline that is on the ‘uptrend’. 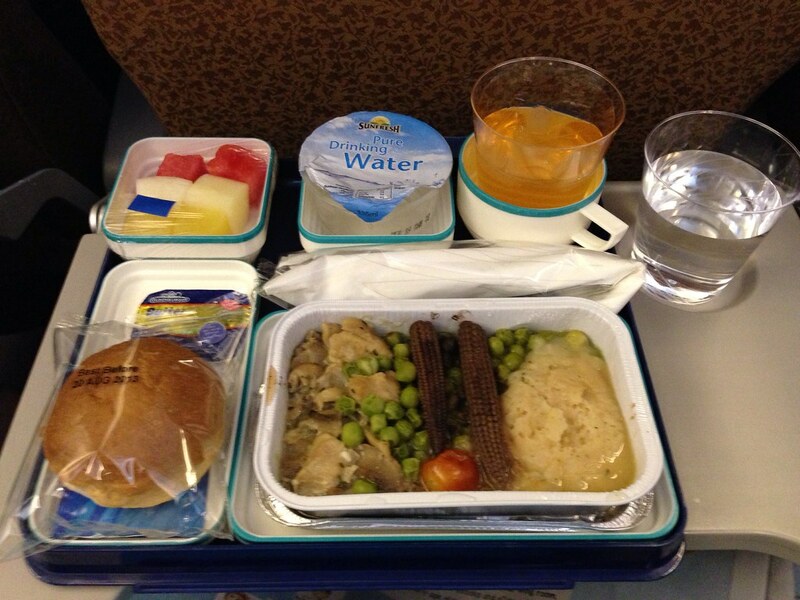 Another unhappy flight I had with Garuda Indonesia occurred recently for a domestic flight. I arrived on time to check in but the long queues at the counter with little staff assistance meant by the time I reached front to check-in I have missed the minimum required time to check in by probably 7 minutes. I needed to check-in by 12:55pm for a 1:25pm flight but my iPhone synchronized local time was showing 1:04 when I enquired to check in. What angered me was the way the agent actually referred to his watch which indicated 1:10pm, when the airport clock is still on 1:04pm. While I admit I should have arrived earlier, I was not expecting such a long queue and disorganized check-in for travellers. Moreover I had no check-in luggage at all, which means I did not see the need to arrive even earlier than necessary considering I have even factored in a 20 minute wait time for check-in. When I was asked to proceed to the help-desk counter, the lone agent was probably one of the most uncaring agent in the world. He did not seem to care the anxiety of all the passengers that had a misconnect and did not seem to be interested to update passengers on the situation. If such is the service and catering standards of an airline that can be awarded a world’s best moniker, there must be a huge mistake in the ranking or maybe these awards are just bought?